SlideShare, one of the best places on the Web to host your content online and embed it downstream, introduced custom branded microsites this morning, aimed to provide businesses with branded channels that are measurable, showcasing content from presentations, white papers and Web seminars. Combined with the company's AdShare and LeadShare products for targeted promotion and lead capture, and you can see SlideShare setting the stage for serious demand generation from marketers. New branded channels on SlideShare now can feature customized headers and summaries, presented with the host's logos and appearance, rather than the generic SlideShare interface. You can see this in place on my custom louisgray.com SlideShare channel, or those from other early practitioners, such as ReadWriteWeb or Frost & Sullivan. 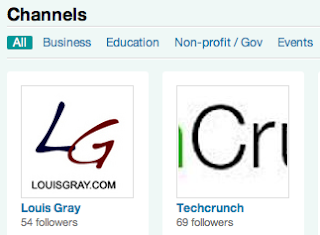 A directory of branded channels can be found at http://www.slideshare.net/channels. Should It Be Harder to Unfollow Than to Follow?